Congress-going youth have had an exciting week in the Youth Room, with pro simuls, mini tournaments and prizes, prizes, and more prizes. 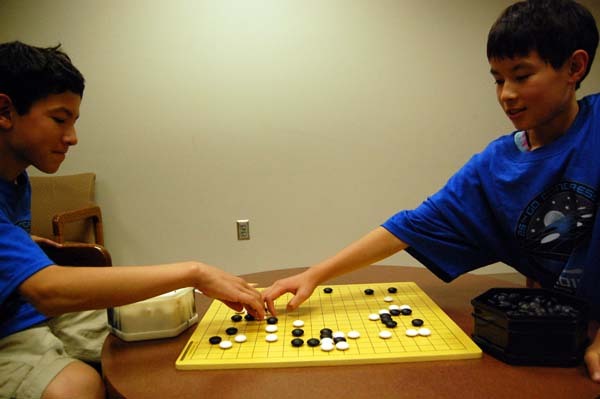 Thanks to the generosity of Winston Jen, every kid at the Congress has won a free set of all seventeen volumes of the Hikaru no Go manga. 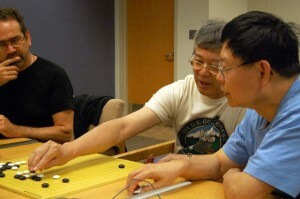 DVD sets of popular series like Hunter x Hunter and Fruits Basket, piles of Hikaru no Go merchandise, Audio Go Lessons from Guo Juan, and donations from Art of Problem Solving.com and Wolfram Mathematica rounded out the prize pool as well. 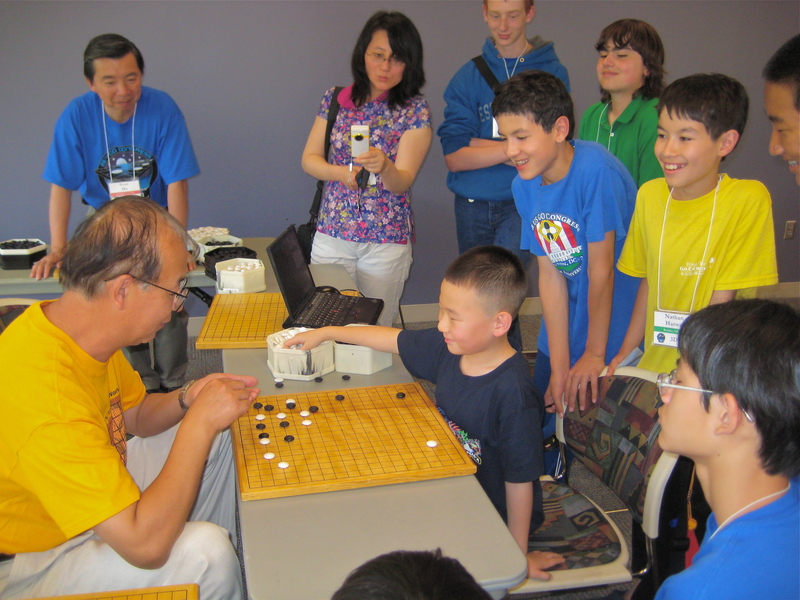 Eight-year-old Aaron Ye 2d (center, in photo at left) enjoyed his game review with Yilun Yang 7p, and so did the crowd that gathered round to watch. Youth also got to play six-on-1 and 8-on-1 simuls with top pros from Korea, China, and Japan. 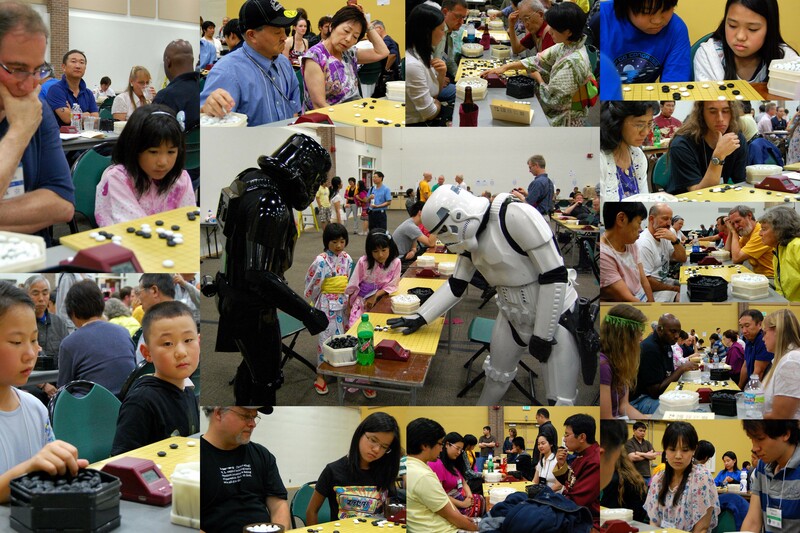 Mini tournaments were held most days, with prizes for 9×9 table winners, 13×13, and Lightning. 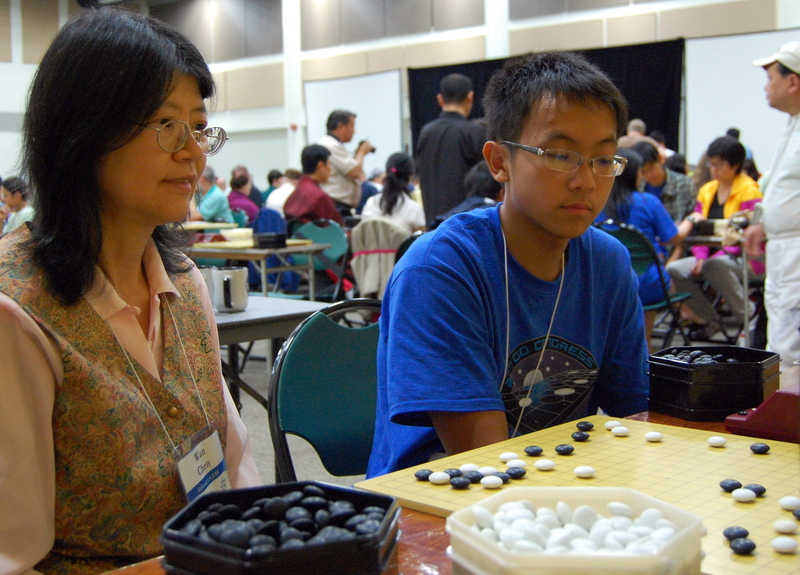 Youth Adult Pair Go remains one of the most popular events, with 44 youth and adults playing this year, paired as one youth and one adult of opposite genders, with a few same-gender pairs thrown in for good measure. 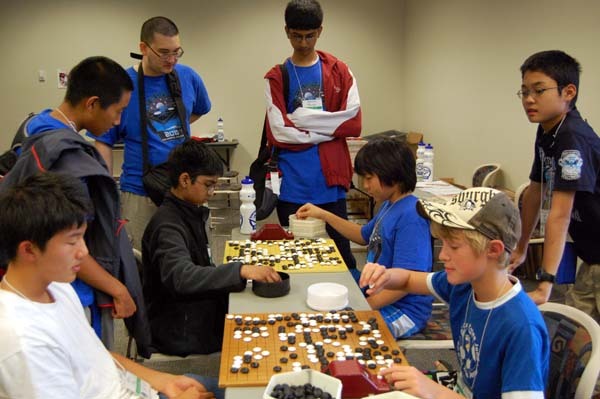 The Youth Team Tournament, modeled after Hikaru no Go, was also popular, with nine teams competing. Top honors went to Keiju Takahara, Oliver Wolf and Takashi Hoshi in the dan division, and Anurag Varma, Albert Hu, and Alvin Hu in the Kyu division. Both teams are playing in the photo at right, while Winston Jen (third from left, standing) observes the match. 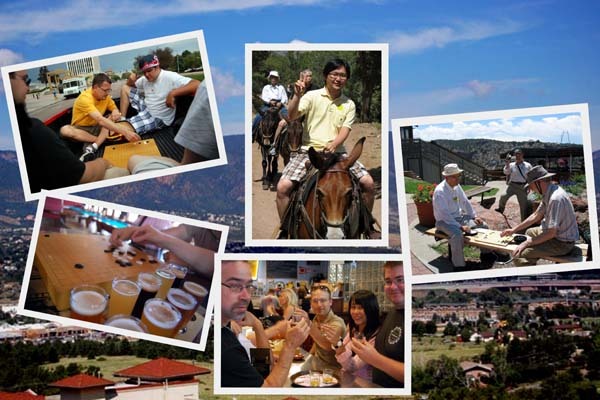 - Paul Barchilon, Youth Editor, photos by Paul Barchilon (top left) and Chris Garlock (bottom right). 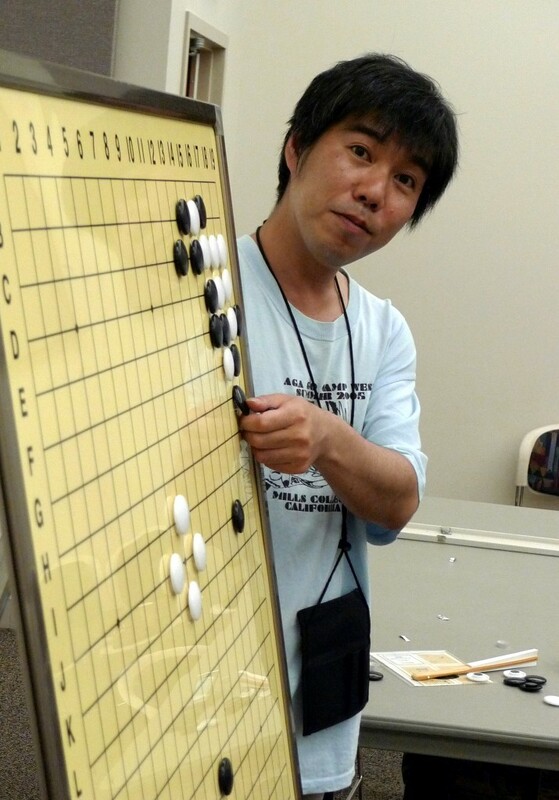 “Don’t try to fight too much, some people really like to fight, but go is a peaceful game,” Ryo Maeda 6P said in his lecture on Friday at the U.S. Go Congress. Due to popular demand, a fifth lecture was added — four were originally scheduled — and Maeda picked up where he left off on Thursday with techniques for attaching to the 4-4 point. 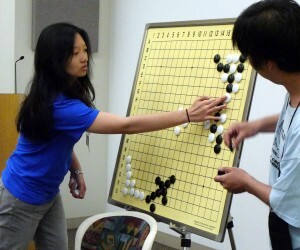 “The simpler you play, the less mistakes you make, and your chances (of winning) increase — simple is better,” he said. When faced with an invasion from your opponent, he doesn’t recommend “trying to kill”, because “once they live in your territory, your loss is so large — let them live small instead.” But “you always want to punish someone who overplays.” One way to do that is to exploit the weakness of a group with only two liberties. “Two liberties is more dangerous than you think,” Maeda said. A group with two liberties “makes normal moves for nearby groups dangerous.” He demonstrated several examples and joked that “if you do this against a 5D player, they cry.” Translator Yoshi Sawada 6D pointed out several times that Maeda used English phrases: “see he speaks English — very soon I will be out of a job,” he joked. Not only was it a bonus lecture, but it also went on for more than an hour and a half, and Maeda looked ready to keep on going, but — like the Congress itself — all good things must eventually come to an end. Fortunately, there’s always next year. Yongfe Ge 7D unsuccessfully tries to avoid fighting with Myung-Wan Kim 9P in this U.S. Open Round 5 game. 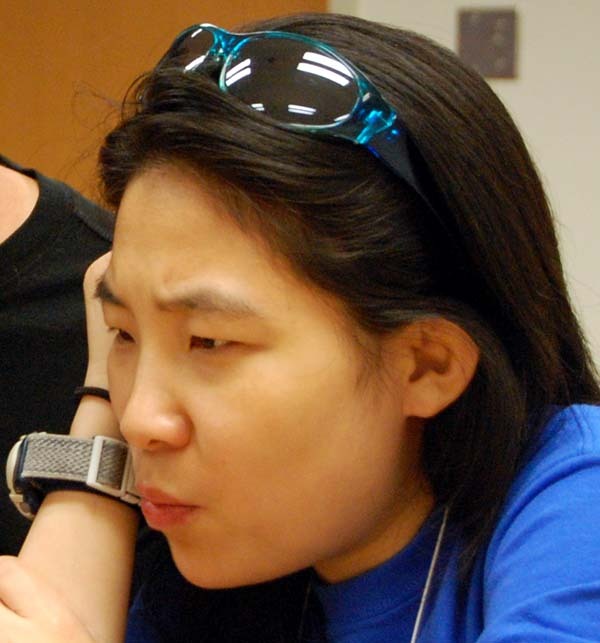 Cathy Li 1P (r) shows how two of Ge’s moves early on enable Kim to get a three-way attack going that determines the flow of the rest of this exciting game. UNDEFEATED: U.S OPEN 4-0 WINNERS: With two rounds to go, the following players are undefeated thus far in the U.S. Open: Terry Benson, Tucker Burgin, Gordon Castanza, William Gundberg, Albert Guo, Albert Hu, Colin Liu, David Niu, Jesse O’brion, Joel Olson, Jeff Putney, Larry Russ, Roger Schrag, Andrew Shang, Daniel Smith, Myron Souris, Darrell Speck, Myung Wan Kim, April Ye, Peter Zhang. Click here for complete standings/results in the U.S. Open through Round 4. PHILLIPS & FRANKEL DOMINATING SELF-PAIRED: William Phillips and David Frankel together are leading in four of the Self-Paired tourney events. 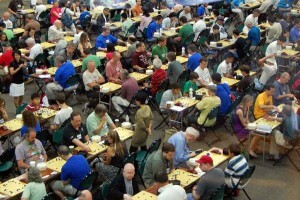 Phillips is still leading for The Champion, increasing his net wins to 9; Frankel and Phillips are currently tied for The Hurricane, with 10 wins each; Frankel has a firm grip on The Giant Killer (Dan Killer) with 8 wins against dan-level players, while Jeffrey Horn’s 4 wins against kyus is holding onto The Keith Arnold (Kyu Killer); The Straight Shooter: Frankel and Phillips both have 5 consecutive wins; Gordon Castanza’s 17 games gives him a good lead on The Dedicated, while Wayne Nelson’s 10 games against weaker players has him in the lead for The Teacher and he’s also leading for The Philanthropist. NOTE: Watch for a Pair Go report and photo album on the website Friday! The E-Journal’s complete Congress tournament coverage online includes the US Open crosstab and results, including game records, the North American Ing crosstab and results (also including game records) as well as Redmond Cup game records and commented US Open and Ing games: Round 1 – Myung Wan Kim (w) vs Tianyu (Bill) Lin (b), commented by Jennie Shen 2P; Round 2 – Curtis Tang (w) vs Eric Lui (b), commented by Maeda Ryo 6P and Round 4 – Eric Lui (w) vs Myung Wan Kim (b), commented by Cheng Xiaoliu 6P. Also included is a photo album of all 32 Ing players.